This is the first post in what I anticipate being a series of articles interacting with the 95 Theses for an Authentically Christian Commitment to Counseling by Heath Lambert of the Association of Certified Biblical Counselors (formerly the National Association of Nouthetic Counselors). Dr. Lambert writes that his goal for his 95 Theses is two-fold: (1) to prompt a debate about what is and is not authentically Christian counseling, and (2) help renew the church’s commitment to excellence in authentically Christian counseling. On the first goal, I prefer to begin the discussion in the tone of a conversation rather than a debate, but believe he raises many important subjects for discourse. I have no expectation that Dr. Lambert will interact with each or any of these posts, although I welcome the opportunity to be sharpened and have invited him to do so. To date I am aware of four individuals who have, directly or indirectly, engaged with Dr. Lambert’s 95 Theses and/or his subsequent plenary address at the ACBC national conference. If I become aware of others, I will post links to those as well and mark post the are written after this one with an asterisk (*). Donn Arms writes from a traditional Biblical Counseling perspective. Warren Throckmorton writes from a Christian Psychology perspective. Bob Kellemen has written 95 Affirmations for Gospel-Centered Counseling that he formulated from the Confessional Statement of the Biblical Counseling Coalition–a document developed by over 3 dozen biblical counselors. David Murray posted an examination of his views about the strengths and weaknesses of the Biblical Counseling movement on The Gospel Coalition site. Dale Johnson responds to David Murray’s TGC post by cautioning against allowing the term “biblical” to lose it connotations of being distinct from other counseling theories at the ACBC blog. Bob Kellemen also responds to David Murray’s TGC post by drawing a helpful progression for what it means to use extra-biblical information for counseling and when that is and is not problematic. * David Murray posted his perspective on the need for this series and his concern that Dr. Lambert’s 95 Theses implies that anyone who’s views do not align with a traditional biblical counseling perspective are not faithfully protestant. As for his second goal, I share his passion and am eager to play any role in improving the quality counseling in/for/by the church. My prayer is that this series will contribute to that goal. I believe there are a few elements of my training and ministry background that might make my voice in the conversation valuable on a subject like this. I identify as a biblical counselor but am what might be called a “biblical counseling free agent.” My graduate training was in the biblical counseling program at Southeastern Baptist Theological Seminary, where I am now teaching, and my counseling has always been in a ministry-based setting (rather than a licensed or clinical setting). But I do not have the certificate or certifications from any of the leading biblical counseling organizations: ABC, ACBC, CCEF, IABC, IBCD, etc. I value the core tenants of biblical counseling – more on that in a moment – but have not aligned myself with any particular credentialing body within the movement. I hope this brings objectivity. I do serve as a Council Board member with the Biblical Counseling Coalition. I have served in both the parachurch and local church setting. Having served in the parachurch setting for close to a decade, I have an appreciation for the unique opportunities and challenges that come when your relationship with an individual is “purely counseling” – getting to know a stranger from a set of intake forms forward in the midst of a crisis. For years I counseled without the benefit or limitations of being a pastor, having direct contact with a small group leader, knowing deacons who could be called on to serve, etc. I have also spent 6+ years leading the counseling ministries of a local church, experiencing the benefits and challenges that this role provides. I believe serving in both the parachurch (close to a professional model in terms of formality and compensation structure) and local church settings offers a helpful perspective for thinking through Dr. Lambert’s 95 Theses about evangelical Christian counseling. How I appraise and interact with those who do not identify as biblical counselors is different, at least in my estimation, from that of Dr. Lambert. Many of the counselors Dr. Lambert has called on to repent for their approach to counseling – Eric Johnson, Diane Langberg, Mark Yarhouse – are individuals from whom I have learned a great deal and believe serve the church well. They do not identify as biblical counselors, and I do not consider them to be biblical counselors. I consider them to be friendly counseling neighbors within the larger Evangelical Christian counseling efforts whose work is complementary to my own. There are places where I disagree with them (at least prioritizing things differently), as I am sure they would do the same with me. As I walk through these 95 Theses with greater reflection, one of my curiosities will be to determine how Dr. Lambert and I differ significantly on this matter. 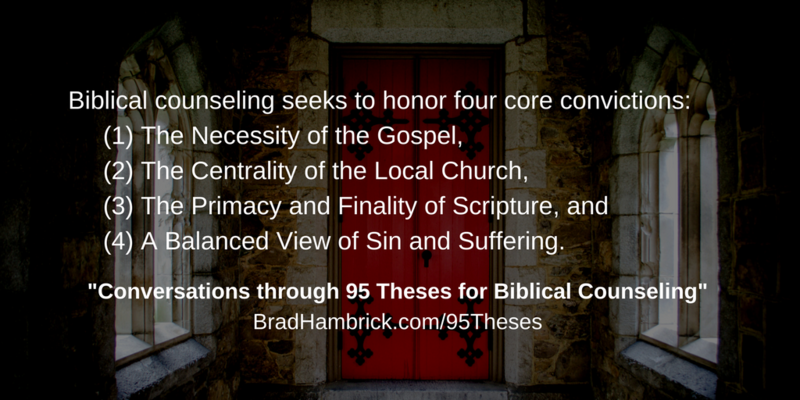 One last question should probably be addressed in the opening post to this series, “What do I mean by biblical counseling?” I don’t have 95 Theses, but I will offer the four points I emphasize whenever I am asked to define biblical counseling. Biblical counseling seeks to honor four core convictions. The Necessity of the Gospel. To be a Christian is to have acknowledged one’s need for and professed faith in the gospel. Counseling that is Christian will point to the saving work of Jesus Christ as the ultimate solution for all sin-based and meaning-of-life struggles. The goal of the biblical counselor is to have gospel-centered conversations as frequently as possible. The setting of counseling or the spiritual openness of a counselee may impact the timing or depth of these conversations. The Centrality of the Local Church. People were made to live in community. This is part of what it means to be a healthy individual; when “healthy” is defined as living according to God’s design. Therefore, the biblical counselor will encourage participation in a local church. At times, however, formalized counseling provides advantages that temporarily serve a counselee better, or that a counselee is more willing to access, than one-another (e.g., befriending or community life) ministry in a local church or meeting with a pastor. The Primacy and Finality of Scripture. The Bible should have the first and last word on anything it addresses. It may stand out that I did not use the word “sufficiency.” But that term is so central to Dr. Lambert’s development of the 95 Theses, that if I use it here, I would be implicitly accepting all of the implications that come with his presentation. That would not be much of a conversation. So here I choose to use the terms “primacy and finality” to allow room to tease out important distinctions while still honoring the ultimate authority, relevance, and transformative power of Scripture. That is enough for an introductory post to a series. I am not sure how long this series will be or the structure it will take. I anticipate reading and reflecting over Dr. Lambert’s 95 Theses many times in the coming weeks and will post for as long as it seems edifying for the church and sharpening for me personally. If this post was beneficial for you, then consider reading other blogs from my “Favorite Posts on the Church and Counseling” or “Favorite Posts on Counseling Theory” post which address other facets of these subjects.